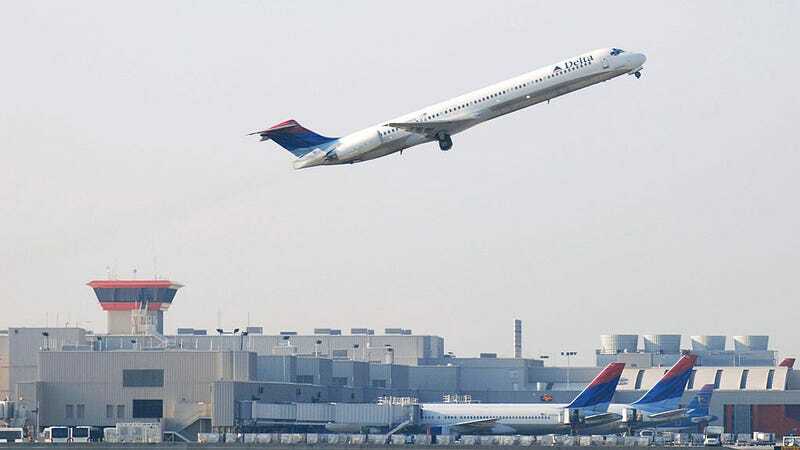 A Delta Air Lines Inc. plane takes off from Atlanta’s Hartsfield-Jackson International Airport April 15, 2008 in Atlanta. I love a good heist movie—Now You See Me, Dead Presidents, all of those Oceans movies. I can even enjoy really terrible heist movies like Widows and Takers. The key to a good heist story is the thieves have to kind of be the good guys and the crime has to make some kind of sense. Clearly, Republicans in Georgia have never seen a good heist film. Not satisfied with just stealing an entire state during the rigged 2018 gubernatorial election, some Georgia Republicans have set their sights on one big final score that will set them up for life. They’re going to steal a $70 billion airport in broad daylight. Worse, if they get away with it, it’ll set off a national Republican crime wave. Atlanta Hartsfield-Jackson is the busiest airport in America, pumping $34 billion worth of business into metro Atlanta and nearly $71 billion into the state of Georgia as a whole. Hartsfield-Jackson is the hub for Delta airlines, the biggest employer in Georgia, and literally hundreds of thousands of jobs are connected to the airport. While planes have been flying off this strip of land in Southern Atlanta since the 1920s, it was Atlanta Mayor Maynard Jackson’s investments in the late ’70s that turned the airport from a glorified set from Wings to the Grand Central Terminal of American airports. The city of Atlanta doesn’t own the airport but runs it, and Atlanta’s mayor and city council control millions of dollars in vendor contracts, businesses and bonds associated with the airport. Now, Republican State Sen. Burt Jones and some of his cronies in the legislature want to steal it. He’s pushing SB 131, which would have the state take over the airport with a governor-appointed board, a supposed solution to the various bribery scandals that have plagued the airport over the years. Of course SB 131 doesn’t fix corruption, it just changes the face, race and place of those who can benefit from it. “We don’t have any secrets around here,” Atlanta Mayor Keisha Lance Bottoms told The Root. Earlier this year, the Georgia University system was found to be shorting pension plans for a decade. The mayor went on to explain how essentially nobody wants this transfer of power to go through. Delta Airlines is sick of being a political football for Republicans and has threatened to leave if the state takes over. The Georgia Chamber of Commerce has said thousands of contracts would become null and void if the state takes over, and the bond holders aren’t happy either. Yet, the bill has moved from the Senate to the House and a $70 billion heist job is just one floor vote away since the session ends on Tuesday, April 2. The catch is, if there’s no business incentive for this bill and the politics are murky, what’s driving this? It couldn’t possibly have to do with race, right? Perhaps the mayor can’t call a spade a spade, but common sense, Georgia history and politics tells a different story. Rock & roll, jazz, hip-hop, the CW prime time lineup, potato salad, you name it, and America has a long history of black people creating or developing great things only to have white Americans come in and try to steal it later using the law, violence or a combination of both. The raw truth is Atlanta Hartsfield-Jackson airport is the economic heart of Atlanta, America’s last chocolate city. The lucrative contracts doled out for the airport haven’t just sustained the city’s black middle class, those contracts make black millionaires with multigenerational wealth. White Georgia politicians have made no secret over the years that they resent that such an economic golden goose has been in the hands of black political leadership for decades. They’d love nothing more than to lock black businesses out of those lucrative decade-long airport contracts. Sen. Burt Jones can claim that he’s fighting corruption all he wants but a simple perusal of his campaign donations shows he’d be just as susceptible to influence peddling if he were on the board running the airport as any other politician. The only difference is he’s white and Republican. Unfortunately, he isn’t alone. Grand Theft Aero seems to be the crime of choice for majority white Republican-led legislatures in recent years. Snatching profitable airports from black majority cities and mayors has been happening more and more throughout the South. Charlotte, N.C., managed to fight the legislature off but the FAA under the Obama administration had to get involved. Jackson, Miss. is still fighting the state airport takeover, and without question if the Georgia legislature steals Hartsfield-Jackson airport it’ll set off a municipal crime wave of Republican state houses robbing every black city/airport combination in the country. As of this writing, SB-131 sits in the Georgia House as a monstrous franken-bill with tons of unpopular amendments that neither the Republican speaker nor Gov. Kemp seems to want to touch. However the legislative session ends next Tuesday and that’s when the security guard is asleep at the monitor, the guards switch shifts, somebody goes on a smoke break and it’s the best time to pull off a heist. The last day of session is notorious for unpopular bills being pushed through in the dead of night. Sen. Burt Jones is no Danny Ocean; he’s more like that weasly Roger Van Zant in the movie Heat, but less qualified people pull off big scores all the time if nobody is paying attention. Hopefully other smart Republicans, Democrats and legislators will get it together and kill this bill; after all this pushback, it’s safe to say Jones doesn’t have the political clout to pull off a sequel.